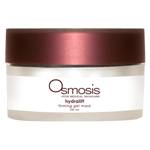 Hydralift Firming Gel Mask Osmosis 30 mil Hydrating and firming mask that promotes soothing and tightening benefits for skin. This is a great mask, my skin feels quite hydrated from it. The texture is quite filmy but once it's on it feels amazing. I've only used it a few times so far and really like it. My skin felt very supple afterwards and when I put on the rest of my products it went on smoothly. I recommend this if your skin is dry or needs a bit of an uplift before heading out.